Avalanches will be possible. Low pressure for the weekend will bring cooler temperatures along with stronger winds and some increased cloud cover. This will slow the warming process and possibly prevent Northerly aspects form softening until late in the day or not at all. Monday brings the return of high pressure with much warmer days through the week and mostly clear skies. Along with this the risk of Loose Wet Avalanches will increase again on all aspects. The mornings will start out firm and fast at all elevations and aspects Where snow exits. A slip can easily result in a slide for life scenario. As the day warms and sun effects the snow pack Loose Wet Avalanches will become possible and present through the dayt and follow the compass rose form the East in the mornings through the South by late morning into afternoon around to Western aspects later in the day. Be aware of the signs of loose wet instability i.e. significant change in temperature, boots sinking into boot top depth, roller balls and pinwheels emanating from rocks. These are all signs of instability. As the forecast changes for Monday the Wet Loose avalanche problem will become more likely with little to no cloud cover, higher afternoon temperatures and little to no overnight freezing. Start easrl when snow conditions are firm and finish early before snow becomes too soft and unsupportable. Use proper equipment for firm icy conditions on your approaches i.e ice axe, whippet and crampons. Fast firm conditions will be likely every morning at all elevations and on all aspects where snow exists especially on the colder days for Saturday and Sunday. 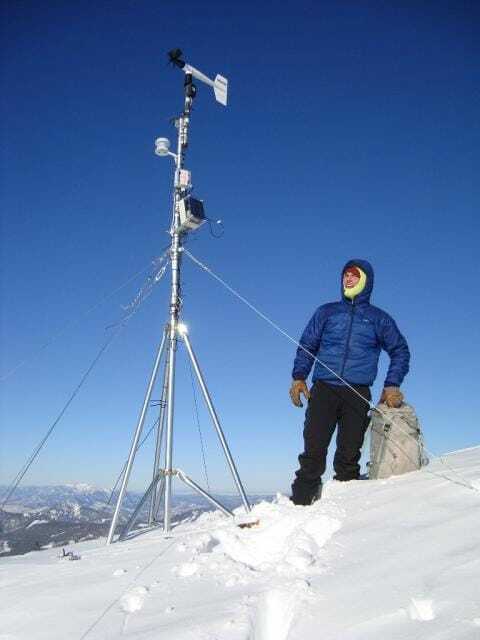 Be especially cautious in sun sheltered Northerly locations and on wind exposed ridges, summits and slopes. A slip and fall could result in a slide for life scenario. Be aware of what is below you as self arrest may be difficult. Use crampons and ice axe and know how to self arrest. 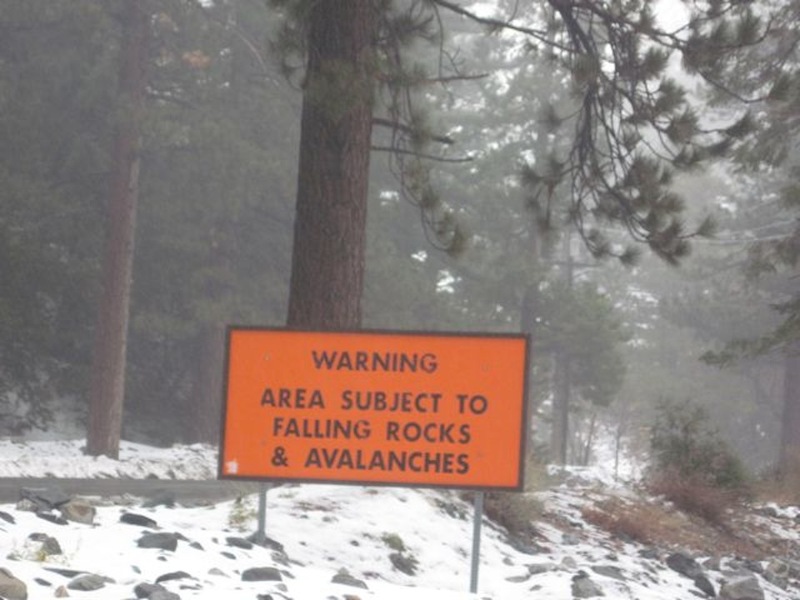 Slip and fall incidents remain one of our biggest problems in the Southern California mountains. Please use the proper equipment, have the experience to use it well and if you are getting into a situation that is uncomfortable back off before retreat becomes impossible. Exercise caution on slopes >30°. Be well aware of your surroundings and changing conditions throughout the day and your travel area. Expect variable conditions, be prepared with the proper equipment and plan accordingly. 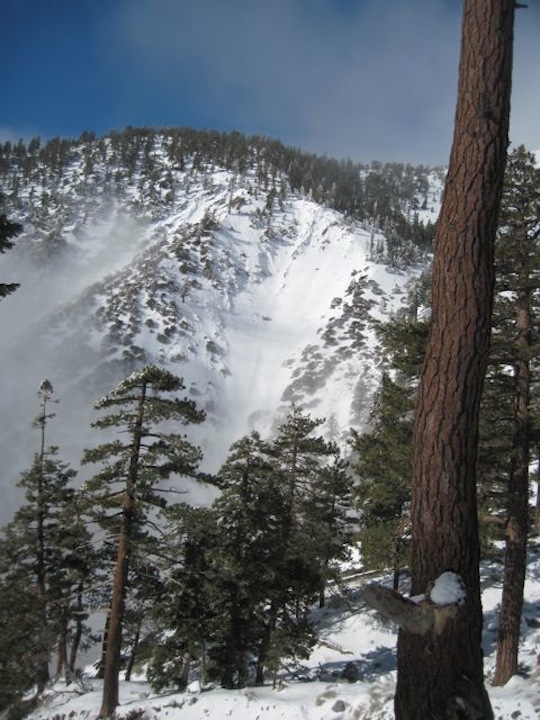 ​Loose Wet avalanches are the release of wet unconsolidated snow or slush. These avalanches typically occur within layers of wet snow near the surface of the snowpack, but they may quickly gouge into lower snowpack layers. Like Loose Dry Avalanches, they start at a point and entrain snow as they move downhill, forming a fan-shaped avalanche. Other names for loose-wet avalanches include point-release avalanches or sluffs. Loose Wet avalanches can trigger slab avalanches that break into deeper snow layers. Avalanche Problem #1 – Loose Wet avalanches will become possible as the day progresses on Southerly aspects especially with solar exposure due to the warmer afternoon temperatures expected. Avalanche concern will progress from East through South to West through the day due to warming temperatures. This problem will become less likely for Saturday and Sunday mainly on Northern aspects due to low pressure and colder temperatures. Monday into next week the likely hood of these avalanches will increas due to the forecast high pressure returning and bringing much warmer afternoon temperatures. General Problem - Fast firm conditions will be likely every morning on all aspects at all elevations especially this weekend due to colder temperatures, stronger winds and some increased cloud cover. A slip and fall could lead to a slide for life scenario. Be aware of your surroundings, especially what is below you. Bring the proper equipment i.e ice axe and crampons and know how to self arrest. 4-21-19 Cool again today with partial clouds clearing out through they. Westerly winds will start out strong to gusty and will return to light winds by the afternoon.The Wind Advisory will remain in effect until 6:00am Sunday morning. Monday will be warmer with sunny dry conditions. Warming will continue into the and of the week. Warm sunny conditions will prevail for Monday through Thursday. Minor cooling will return for next weekend. Firm conditions on the uptick in the morning. Firm and crusty at the summit - wind board breakable crust just off ridge and softening quickly in the afternoon. A short distance below the summit areas were firm with no BP to 20cm BP in other locations. There was a 1cm crust on top of 7cm of softer snow on top of a solid ice block. Not able to dig a pit due to ice layer approximately 8cm down. surface was edge able up high and snow became softer corn while descending. Loose Wet avalanche debris was refrozen on the decent from several side chutes. There was evidence of very large avalanches on the Hwy 2 probably from the valentines day rain event. Good turns where there was no avalanche debris. Ice layer was just below the surface and felt on some turns. ​Toured from Pinos parking area to Sawmill summit and back. Coverage good on Pinos but bare patches are appearing on SE aspects of Sawmill with coverage about 60 percent--still skiable. Snow pit in Pinos First Meadow disclosed bulletproof snowpack approaching ice after 18 inches depth. Skiing involved a quarter inch (yes!) of turnable on top of firm crust on west-facing aspects in the morning, turning to nice corn in the afternoon. Pinos coverage makes skiing the WSW-to-SSW aspect of the Pinos side of the Pinos/Sawmill gully possible--an excellent run approaching 35 degrees. Unfortunately, we were only able to ascend it on the way back, but it should be attractive for the coming week before temps decrease coverage. Sky was clear at mountain low clouds below in the morning. Snow surface soft to crusty in top 3". firm and icy below. Snow was consolidated powder in areas to firm. Edging was great and turns were fun. By noon lower mountain was softening considerably and by 1:30 all surface snow had become wet and heavy. The corn factory is cranking up and spring snow should be here soon. Rapid warming was obvious as there was still snow on some trees from yesterdays storm. By late morning snow was falling from trees and creating small roller balls. surface snow at base area had free water in it. On the drive out fresh roller balls were seen along the rode side slopes due to warming and sun exposure. Good skiing. Snow got heavier around 1pm but snowing s-1 to s1 Through most of the morning. About 3 inches of new snow on top of the MF. And 25-30cms from last weeks storm. Roller balling and loose releases in steep terrain happening naturally by noon. Wind affect was minimal. Winds were mostly light. HS at 7400’ N aspect in wind drifted spot was 135cms.